The art of flying starts with feet rooted on the earth. 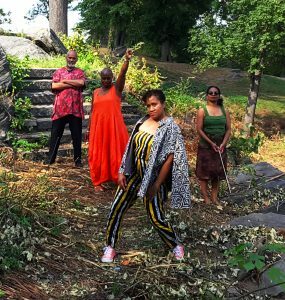 Director Choreographer Marlies Yearby joins collaborators Cooper-Moore, Nioka Workman, Marcelle Lashley and Leslie Parker in music, dance, life and performance. Marlies Yearby (Choreographer) is the Tony-nominated choreographer of RENT. She was the recipient of a Drama League Award for the Los Angeles production of RENT, and the recipient of a Dora Award Nomination for the Canadian production of RENT. Her work was licensed for the film production, and she is also the choreographer of the 20th Anniversary Tour, as well as CINECAST of RENT. As Director and Choreographer of “Brown Butterfly”, a multimedia celebration of the life and times of Muhammad Ali, “The Greatest”, she co-created the concept with Composer Craig Harris with great critical acclaim. Ms. Yearby received a Helen Hayes Award nomination for her choreography for the “Oedipus Plays” at Washington Shakespeare Theatre in Washington, D.C. She was a Bessie Award recipient for her choreography on “Stained” written by Lisa Jones and Alva Rogers. She choreographed Shay Young’s “Blood’s Talking Bones” at the Penumbra Theater in Minnesota, as well as Rita Dove’s “Darker Face of the Earth” at the Guthrie Theater in Minnesota. She was the writer of Sekou Sundiata’s “Mystery of Love” at the American Musical Theater Festival in Pennsylvania. Ms. Yearby was the director for Carl Hancock Rux’s “Geneva Cottrell: Waiting for the Dog to Die” at Mabou Mines, an also directed his piece called “Singing in the Womb of Angels”. Ms. Yearby Is the founder and director of Movin’ Spirits Dance Theater with commissions from Harlem Stages, Kansas Lied Center for the Performing Arts, MASS MoCa, The Exit Festival France, PS 122, The American Dance Festival, Lincoln Center Out Of Doors, and Jacob’s Pillow. She was twice awarded the National College of Choreography Initiatives National Endowment for the Arts Fellowship, and was also awarded the New York Foundation for the Arts Fellowship, the Van Lier Fellowship, and 651 Arts Tradition and Transformation Award funded in part by the Doris Duke Foundation. Her other awards include the BAX TEN Artists in Progress Awards and the DEF Dance JAM Mentor Award. Ms. Yearby is the director and founder of DanceHackIt, a virtual performance space of dancers live streamed simultaneously in Gambia, West Africa, St Lucia, Vermont, and New York. She is a BRIC Community TV producer and sat on the advisory board of the New York Foundation for the Arts. Currently she is developing a web platform for the creative exchange of dance, music, theater, and simultaneous global art interactions streaming live. Writers, Carl Hancock Rux, Laurie Carlos, and composer Cooper Moore further developed Ms. Yearby’s “The Beautiful/Unplugged”, a performance reality libretto on the impact of media on the identity of the American family. She is currently codirecting a project with Aku Kadoga called “Salt”, an AfroFunk, futuristic, multimedia theater piece inspired by the salt mines of Detroit, and written by Jessica Care Moore. She will be directing a collaboration with jazz artist Nnenna Freelon, visual artist Maya Freelon, and choreographer Kariamu Welsh called “The Clothesline Muse”. Ms. Yearby has been a choreographer with the Joffrey Jazz Summer Intensive for the last 5 years. As an artist activist she champions the voices of women, helping to empower their authentic lives everywhere.